Cyberlink's $300 Director Suite 2's component applications are fast reaching the stage at which it might be more appropriate to compare them with pro-level applications such as Photoshop rather than the less expensive programs they actually compete against. Improvements in this new version are substantial, but largely underneath the hood with new 64-bit and Intel hardware acceleration support. Director Suite 2 consists of: PowerDirector 12 Ultimate for video editing; ColorDirector 2, which interfaces directly with PowerDirector for handling color correction and enhancement; PhotoDirector 5 for cataloging and manipulating image files; and AudioDirector 4, for editing soundtracks and other music files. PowerDirector, ColorDirector, and PhotoDirector are all installed as 64-bit applications (a new feature) if you're running a 64-bit OS, but AudioDirector is 32-bit only. The suite supports 3D, 4K video, and surround sound throughout. The editing in the four programs is round-trip if launched from PowerDirector. For instance, uf you select an audio track in PowerDirector's timeline, right-click and send it to AudioDirector, there will be a "back" button at the top of the AudioDirector window would not be present otherwise. Click it and you'll return to PowerDirector after making the choice between using the changes or ditching them. 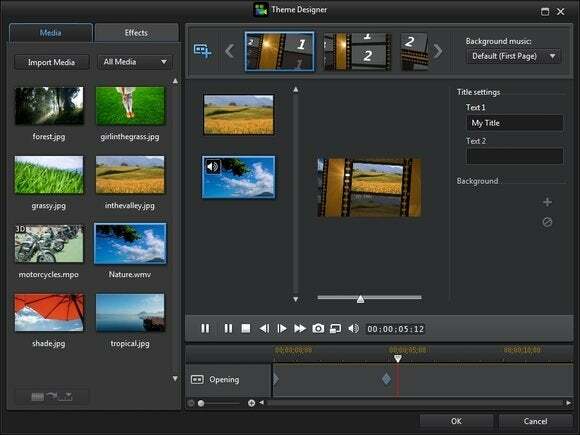 This application is a 100-track video editor with both storyboard and timeline editing, as well as a ton of advanced features and FX. The most interesting new feature is the ability to mix up to four videos on the same screen in quadrants using audio, timecode or manual adjustment to align them temporally. There's also a new theme designer, which provides about 30 video style templates that you can drag media to and preview. 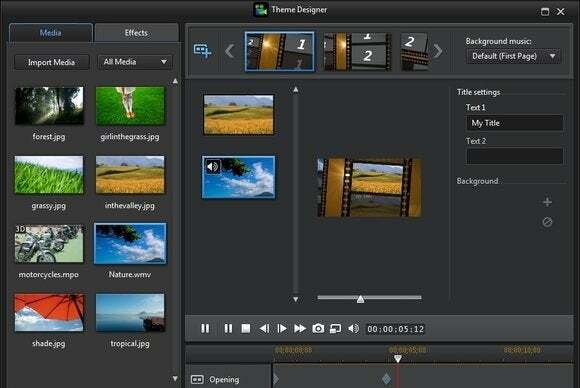 PowerDirector's new theme designer makes it easy to add a professional look to your video productions. Cyberlink has cleaned the PowerDirector interface up a bit, but it remains basically the same—easy, but with a few too many tiny icons. But that's better than most video editors, which have far too many. New internal features include motion blur on objects in PiP (Picture in Picture), faster rendering, plus more intelligent motion detection. PhotoDirector is a very effective photo editor, but only for relatively small batches of files and editing. It doesn't load images very quickly, and has shown a distinct tendency in this and previous hands-ons to choke on large groups of files. I'm talking nearly 100,000 in my test batch, but the file handling features need more work. That said, PhotoDirector is chock-full of nice FX and tweaks (including a host of human beautification features, such as body slimming), and all types of metadata. It also creates music-enhanced slideshows with minimal effort. This version adds face tagging and a very cool feature called bracket HDR. Say you have shots of the same vista from throughout the day or with different lighting techniques. Using bracket HDR, you can combine them to expose details in shadows, darken overexposed areas while still maintaining detail, add the vibrancy of sunset to an early day shot, etc. As an editor, PhotoDirector is arguably the best combination of ease-of-use and power on the market. As a librarian, it needs improvement. If you've wondered about the amazing lighting in movies or TV shows these days, listen up: It's not shoot-time lighting, it's post-production color effects. That's what ColorDirector is all about. ColorDirector's new HDR-like FX can add drama to your video. New for this version is a rather cool HDR effect. There's still the myriad of adjustments including color replacement, hue, saturation, and brightness. And you can apply any of them globally or on regions you select. There are also gradient and motion tracking masks as well as scene detection, and a library of presets with more online. AudioDirector is slowly moving towards being a top-shelf audio/wave editor, though it still has a ways to go. All the basics are there such as FX, normalization, cutting pasting, etc. and it now supports VST effects. Alas, you have to go searching for them yourself even though there are two common locations where they are invariably installed. Also, when I tried to apply a couple of VST FX that I use with monophonic tracks all the time, AudioDirector stated that they were only for use with stereo files. Other than that, AudioDirector is super easy-to-use, has some very nice effects of its own, offers very good noise reduction, has a spectral view, let's you mix multiple files, and features a very competent layout system for creating CD's. 5.1 and 7.1 surround sound are fully supported as well as resolutions up to 192kHz/32-bits. You can also keep multiple files open and cut, copy, and paste between them. AudioDirector now supports VST plug-ins, but only for stereo...and you have to hunt them yourself. Cyberlink also includes its WaveEditor 2 audio editor, though it's not entirely clear why, with the presence of AudioDirector. Cyberlink Director Suite 2 remains one of the best media editing and production suites out there. It's individual component applications compare well with pro-level programs that cost a lot more. It's also available in other combinations for less money and the individual modules are sold separately. If you're shopping for the first time, Director Suite 2 belongs on a very short list. You could easily produce a very nice film with it. As an upgrade for existing users, the new features are nice but not earth-shaking, so I'll call it a toss-up on whether to upgrade for $170 or wait an iteration. This update adds some pleasant features, but most upgrades are under the hood.